"The question is, what do we need to do? The Prophet Joseph's counsel was to present in the temple 'the records of our dead, which shall be worthy of all acceptation' (D&C 128:24). 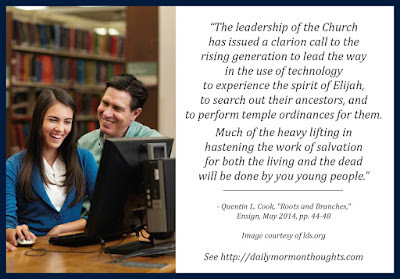 "The leadership of the Church has issued a clarion call to the rising generation to lead the way in the use of technology to experience the spirit of Elijah, to search out their ancestors, and to perform temple ordinances for them. Much of the heavy lifting in hastening the work of salvation for both the living and the dead will be done by you young people. 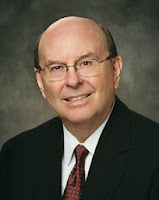 "If the youth in each ward will not only go to the temple and do baptisms for their dead but also work with their families and other ward members to provide the family names for the ordinance work they perform, both they and the Church will be greatly blessed. Don't underestimate the influence of the deceased in assisting your efforts and the joy of ultimately meeting those you serve. The eternally significant blessing of uniting our own families is almost beyond comprehension." "The hastening of the work of salvation" is a fascinating theme. In general, work can be hastened for a number of reasons: running out of time for completion, increased awareness of the importance of the work, improved tools to perform the work, etc. Perhaps all of those apply to the "work of salvation" that Elder Cook is discussing. Certainly, we are blessed to have increased access to temples as one of the great tools to facilitate that work. And the additional benefit of worshiping in temples "for spiritual renewal, peace, safety, and direction in our lives" is a profound blessing. I am thrilled as I serve as a temple worker to see the youth coming early in the mornings in great numbers to participate in baptisms. It's inspiring to see their faithfulness and eagerness to serve in that sacred setting. So many are taking the "clarion call" seriously in helping to hasten the work!